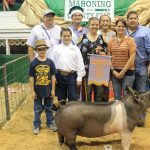 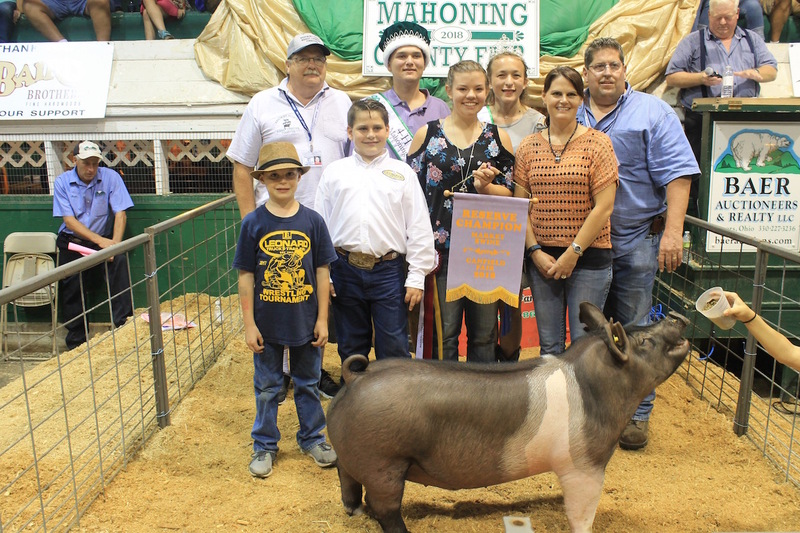 Madalyn Black sold her 275-pound grand champion hog for $27/pound to Sarchione Chevrolet, Randolph, represented by Ryan Oprandi. 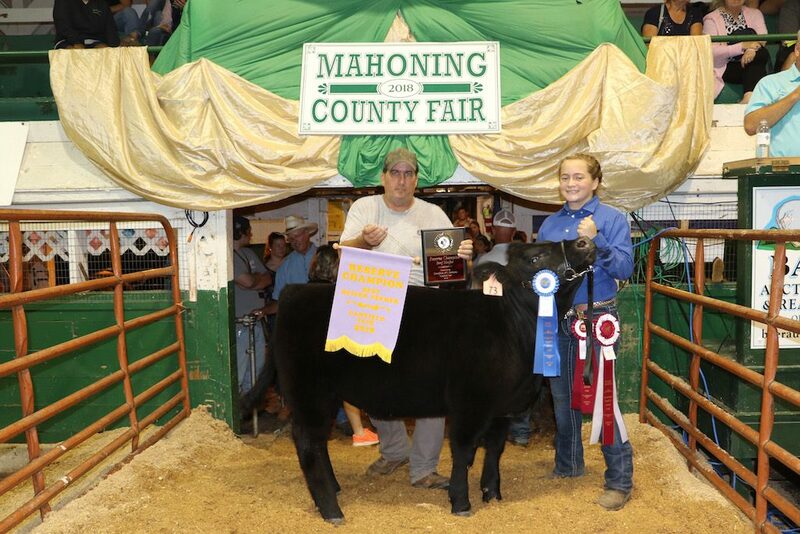 Also pictured are Junior Fair Outstanding Youth James Moore and Brittany Siembieda. 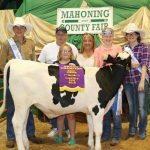 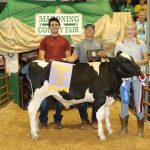 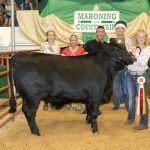 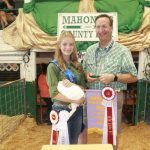 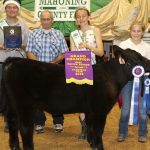 The 2018 Canfield Fair junior fair market livestock sales were held Aug. 30 and 31, and the cheese basket sale was held Sept. 2. 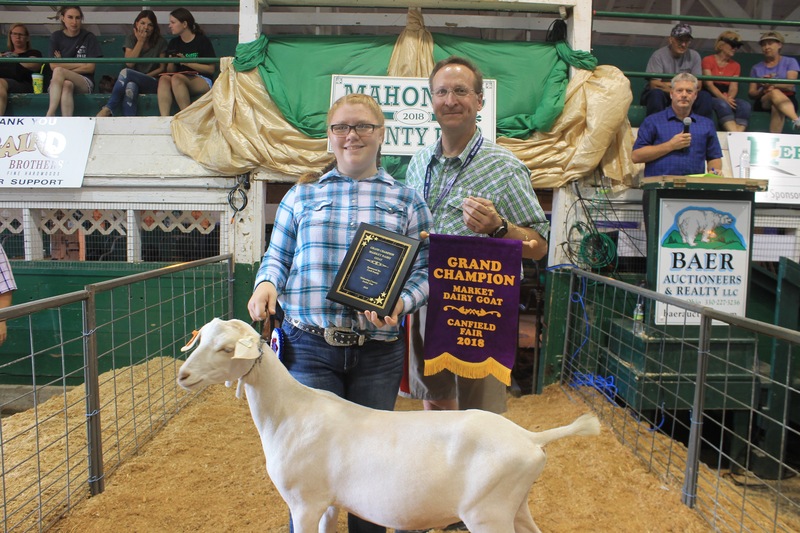 Here’s a recap of the grand champion exhibitors and their final sale bids/buyers. 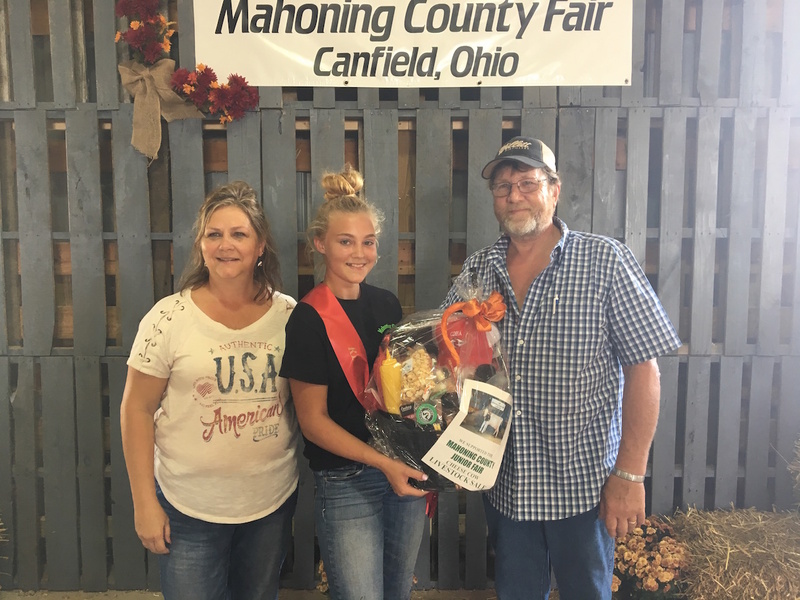 Scroll down for a slide show of the winners, or click on the individual exhibitor’s name to see a photo. 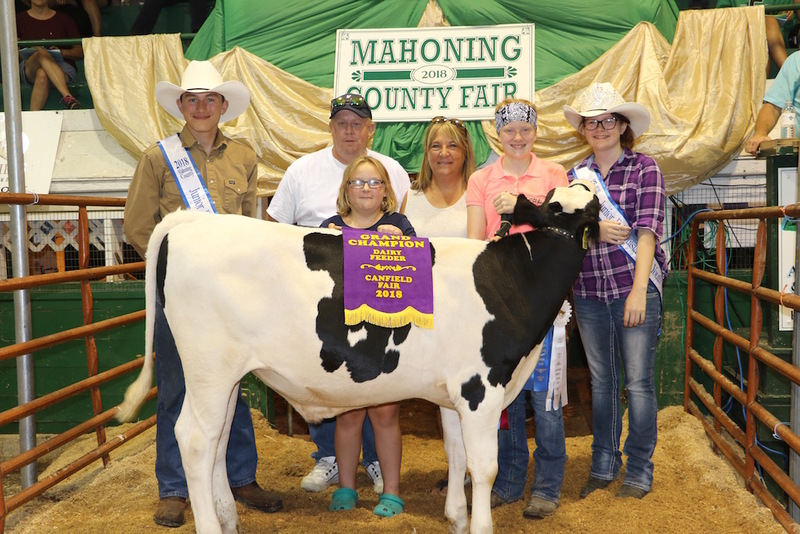 This information has been updated with the cheese sale, as well as an overall sale total and averages. 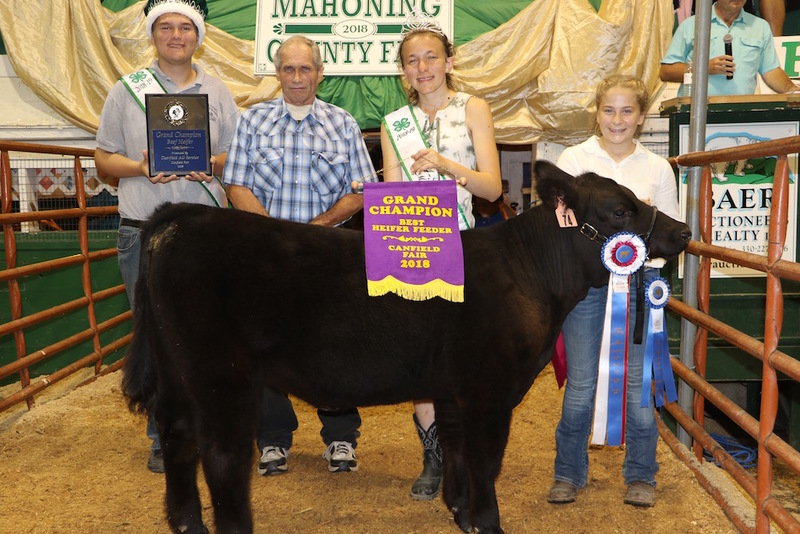 Madalyn Black’s 560-pound grand champion dairy beef feeder sold for $750 a pound to Rogers Mill, represented by Cindy, Kait and Bob Black. Also pictured are Outstanding Youth James Moore and Brittany Siembieda. 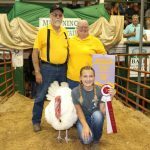 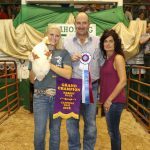 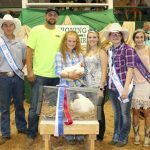 Samantha Plocher’s grand champion pen of broiler chickens sold for $1,000 to Cornerstone Electric, represented by Logan Jarvis and Katie Higgins. 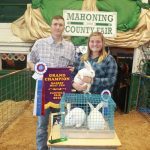 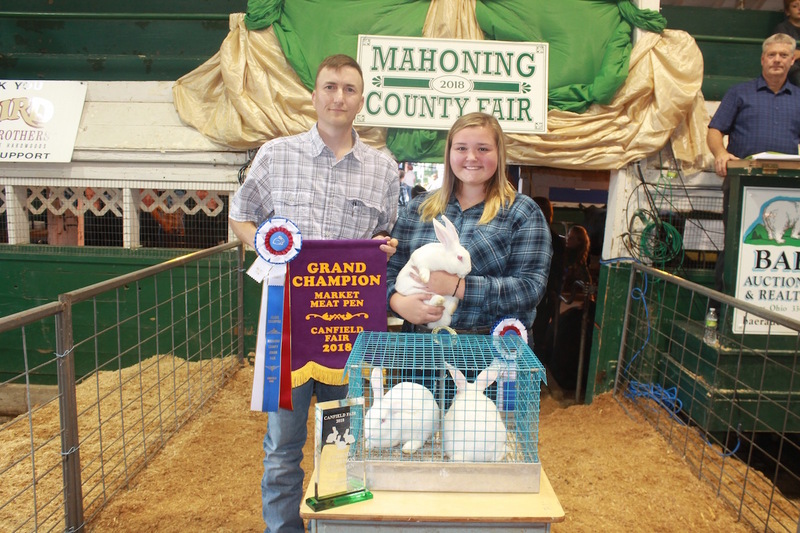 Lisbon Veterinary Clinic represented by Stephen Miletta, DVM, purchased Marisa Maillis' grand champion rabbit meat pen for $150 per head. Emily Hemphill won grand champion market goat with a 101-pound entry she sold to Attorney Lynn Maro for $3.50/pound. 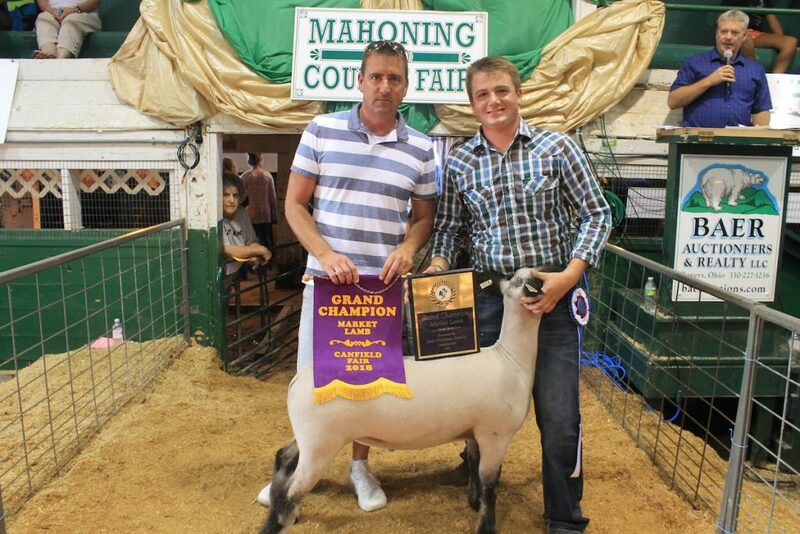 Wyatt Baird won grand champion market lamb and senior showmanship. 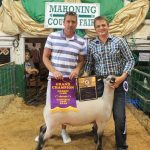 His 127-pound lamb was purchased for $13/pound by Sarchione Chevrolet, Randolph, Ohio, represented by Ryan Oprandi. 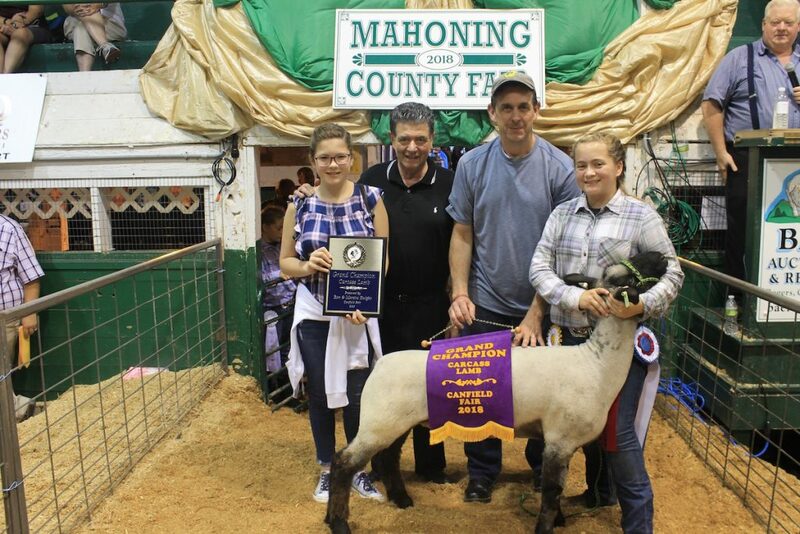 Abigail Gay sold her 138-pound reserve champion carcass lamb for $10/pound to Sarchione Cheverolet, Randolph, represented by Ryan Oprandi. 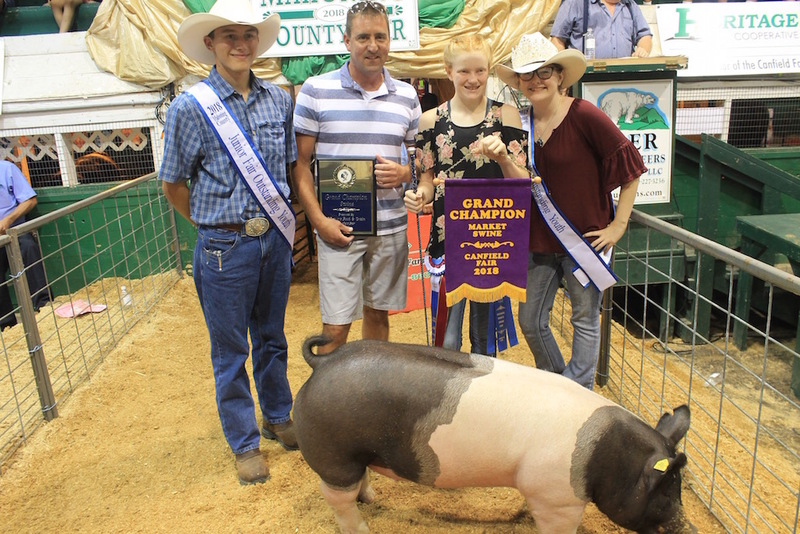 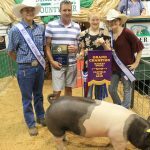 Emily Hemphill won reserve champion hog and senior showmanship. She sold her 261-pound hog to Leonard Truck and Trailer, reprsented by Clint, Cash, Cord and Tiffany Leonard. 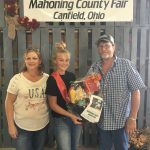 Also pictured is Dwain Vanuker and junior fair royality Matthew Fetty and Callia Barwick. 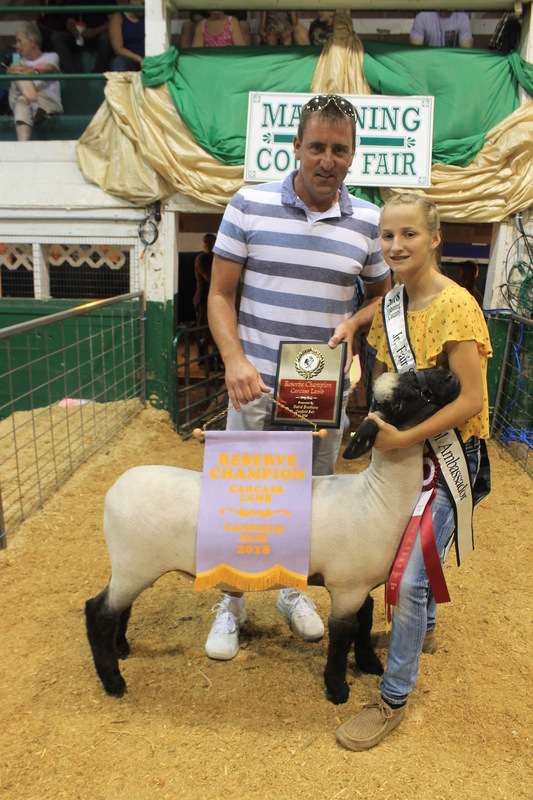 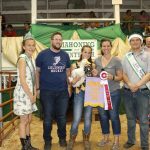 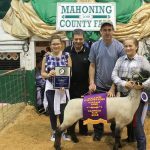 Sarchione Chevrolet, Randolph, represented by Ryan Oprandi purchased Katie Cambell's 137-pound reserve champion lamb for $8/pound. 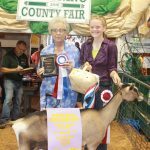 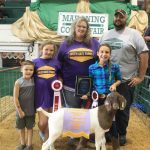 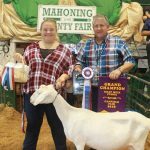 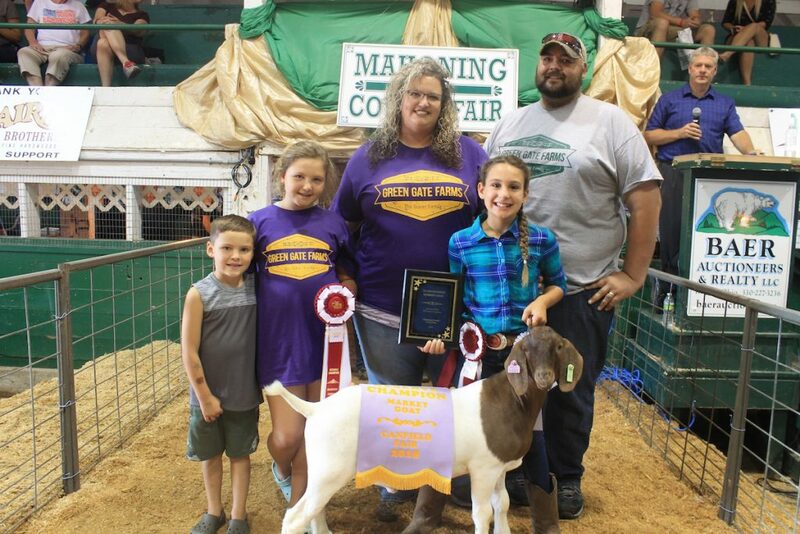 Gisella Anguilli sold her 94-pound reserve champion market goat to Green Gate Farms, the Greier Family. 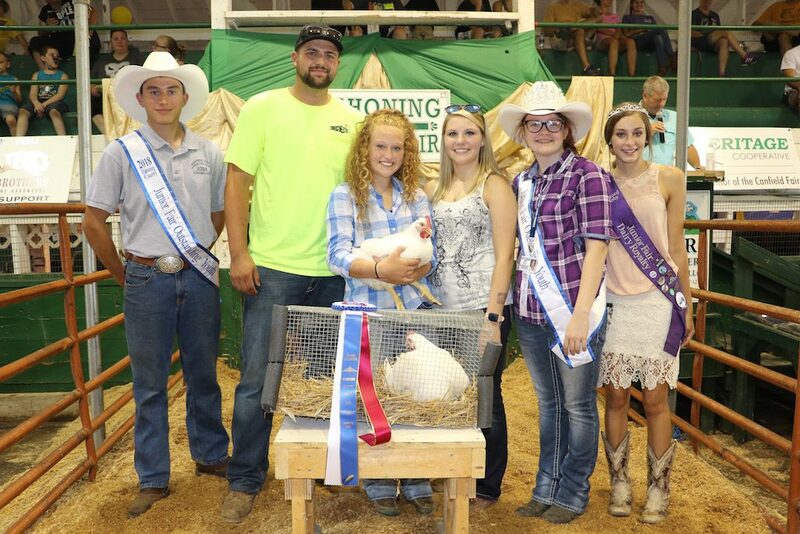 They were represented by Wayne, Sara, Lacie and Blake Greier. 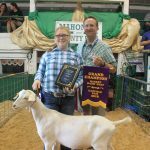 Cherokee Mellot sold her grand champion goat fudge to Don Snyder of Snyder Antique Auto Parts for $600. Kearstin Rummel sold her 5.2-pound grand champion fryer rabbit to Jeff Taylor for $200. 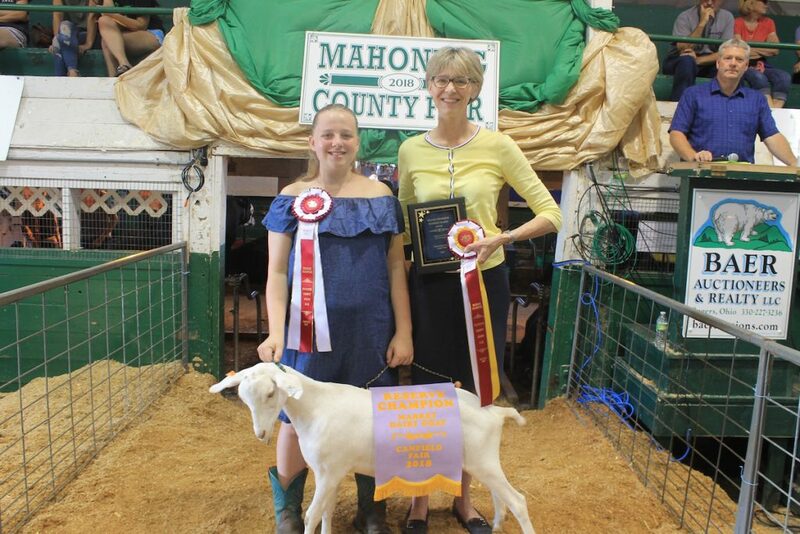 Also pictured is Denise Tomko. 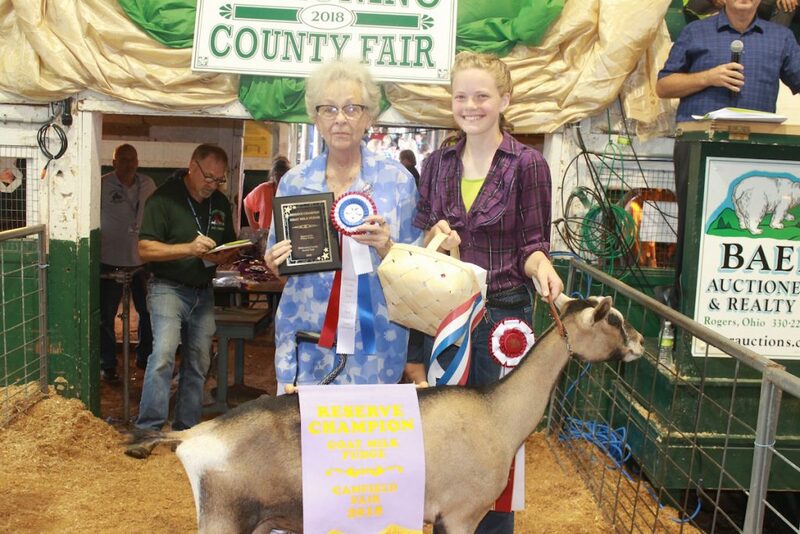 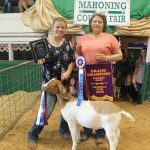 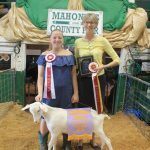 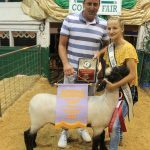 Kaylee Burcaw won reserve champion goat fudge. 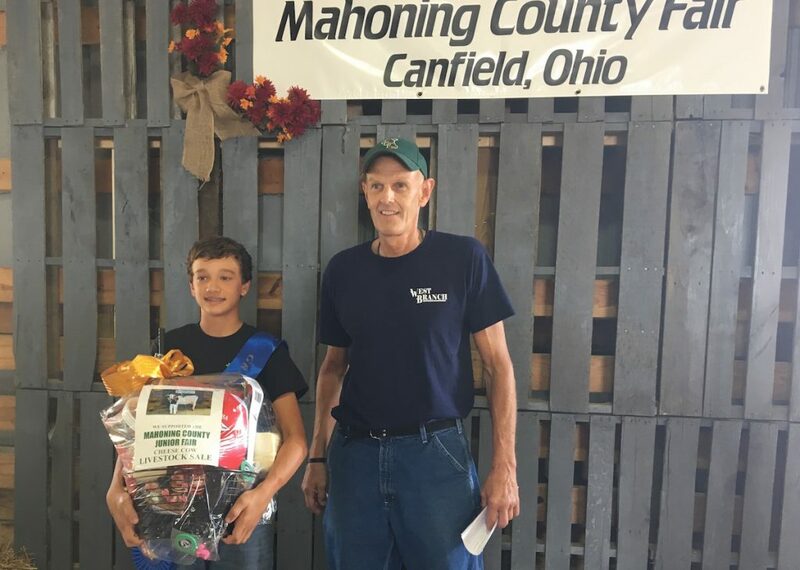 Ted and Virginia Campbell purchased the fudge basket for $650. 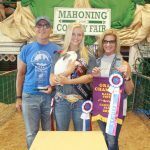 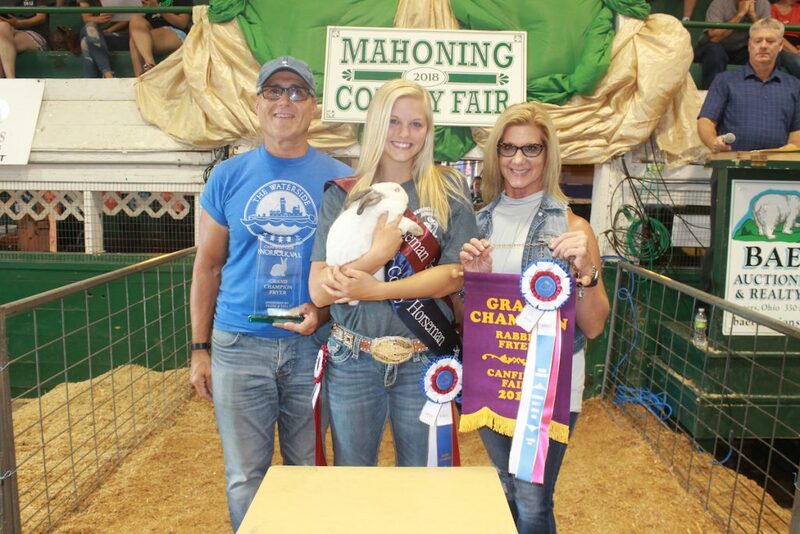 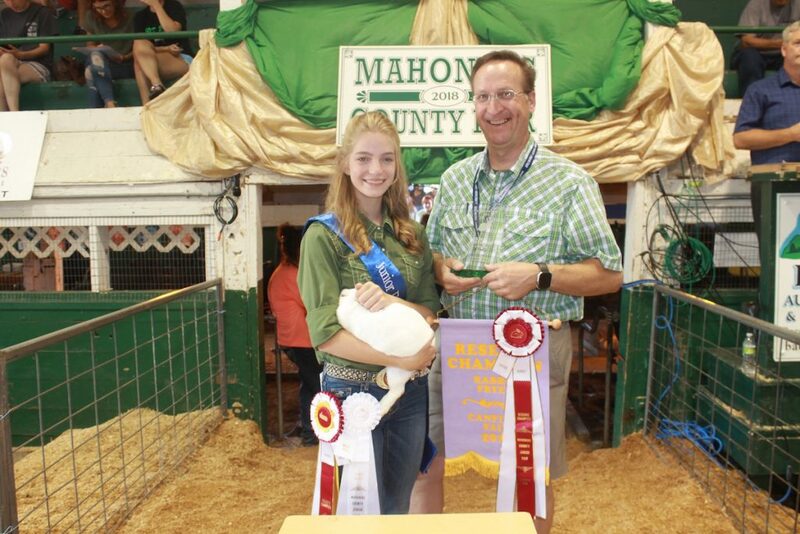 Attorney Donald Duda purchased Emma Reph's reserve champion fryer rabbit weighing 4.9 pounds for $200. 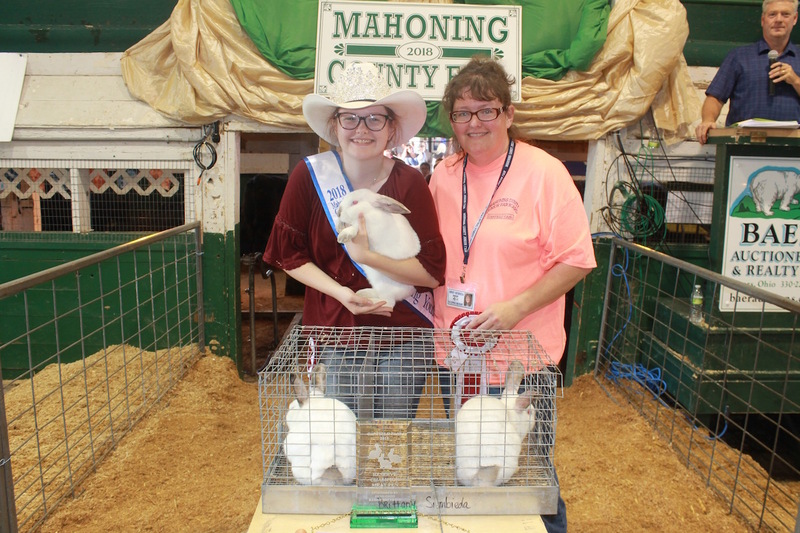 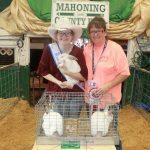 Brittany Siembieda sold her reserve champion rabbit meat pen to Malinda Siembieda for $155 per head. 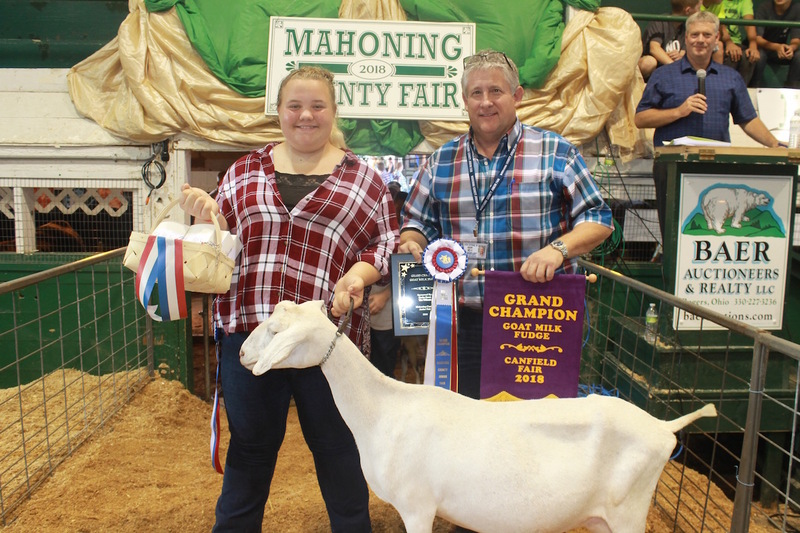 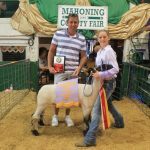 McKenzie Whitted sold her 137-pound grand champion carcass lamb to Rulli Brothers Markets, Austintown and Boardman for $9/pound. 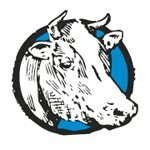 Rulli Brothers was represented by Haden, Frank and Michael Rulli. 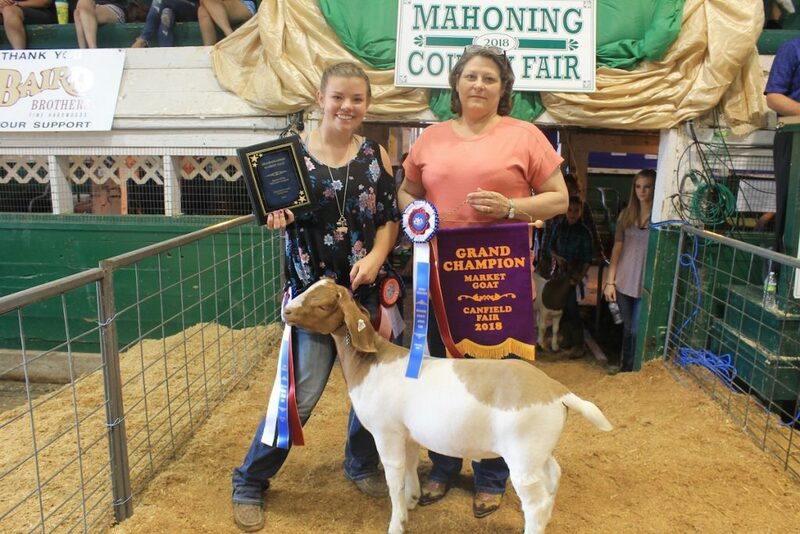 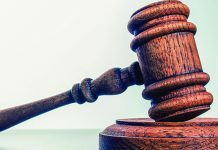 Camille Kirk sold her grand champion market dairy goat, weighing 110 pounds, to Attorney Donald Duda for $2.75/pound. 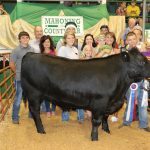 Taylor Whitted raised this year’s grand champion beef feeder heifer, weighing 508 pounds. 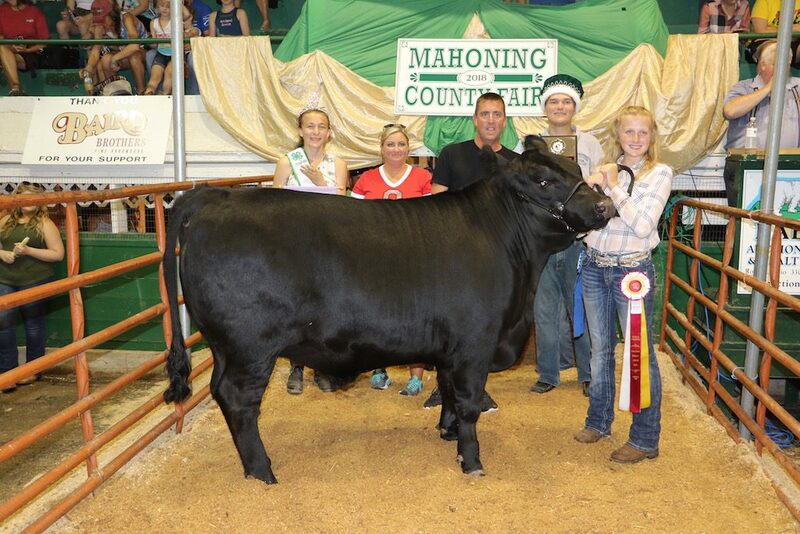 It sold for $5 a pound to Rick Hedrick, of R. Hedrick Trucking. 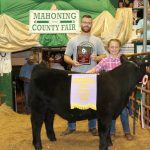 Sam Kanagy’s 1,355-pound grand champion steer sold for $12.50 a pound to Mac Trailer, represented by the Conny and Raber families. 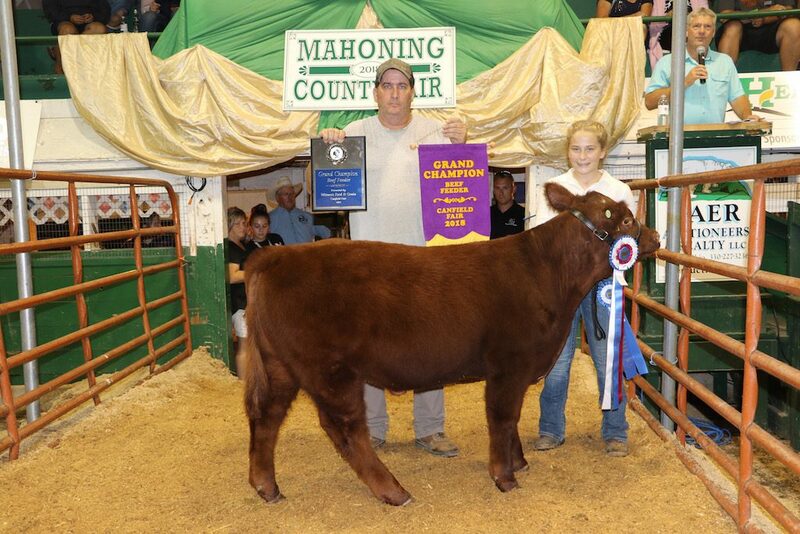 McKenzie Whitted’s reserve champion heifer beef feeder, weighing 516 pounds, sold for $2.50 a pound to Roger Whitted. 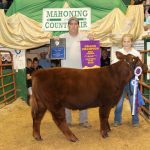 Larissa Fano’s 550-pound reserve champion beef feeder sold for $5 a pound to Paris-Washington Insurance, represented by Hunter Palmer. 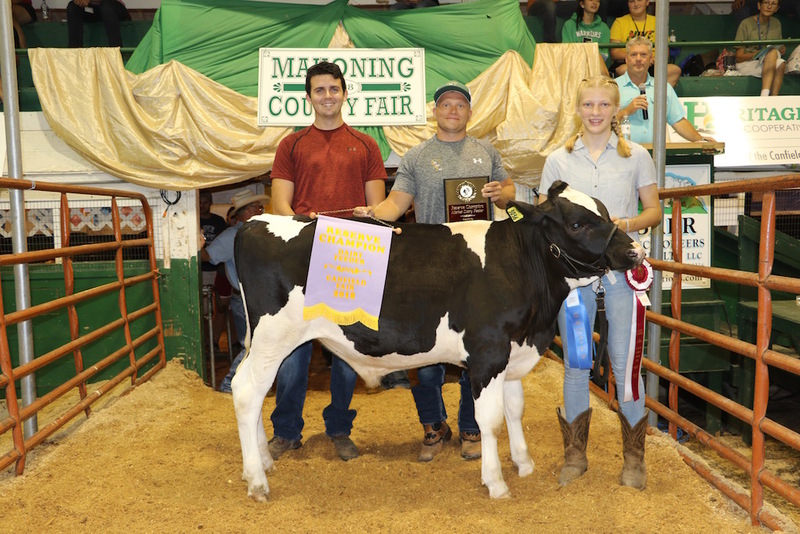 Jenna Witmer’s 498-pound reserve champion dairy beef feeder sold for $6.50 a pound to Cows Come First, represented by Jacob Oliver and Cody Kurtz. 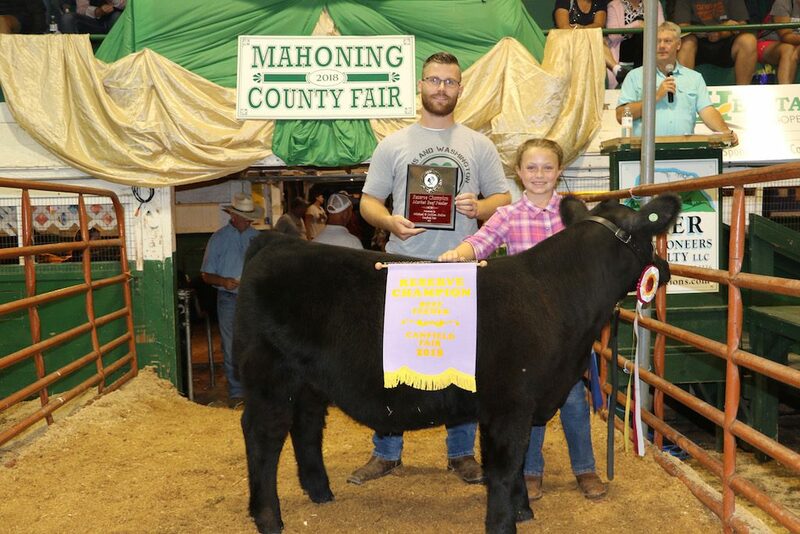 Josie Mellott raised this year’s reserve champion steer, weighing 1,320 pounds, which sold for $10 a pound to Sarchione Chevrolet, represented by Ryan and Sue Operandi. Also pictured are 4-H King Matthew Fetty and 4H Queen Callie Barwick. Kearstin Rummel raised the grand champion duck, weighing 8 pounds, which sold for $400 to Mac Trailer, represented by Mike and Dawn Conny. 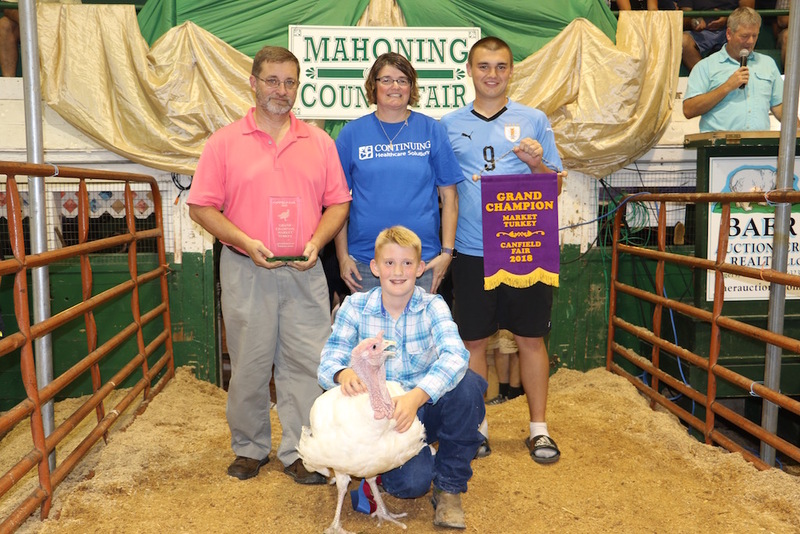 Jackson Young’s 34-pound grand champion turkey sold for $800 to Dean’s Funeral Home, represented by Scott, Tonya and Zach Dean. 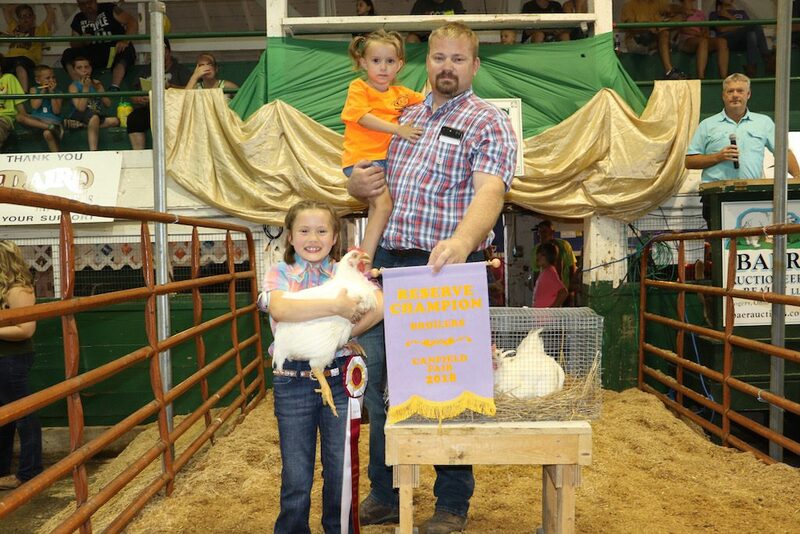 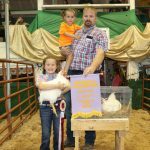 Seed Consultants, represented by Jared Myers (holding Neva Zippay), paid $1,200 for Stella Zippay’s reserve champion pen of meat chickens. 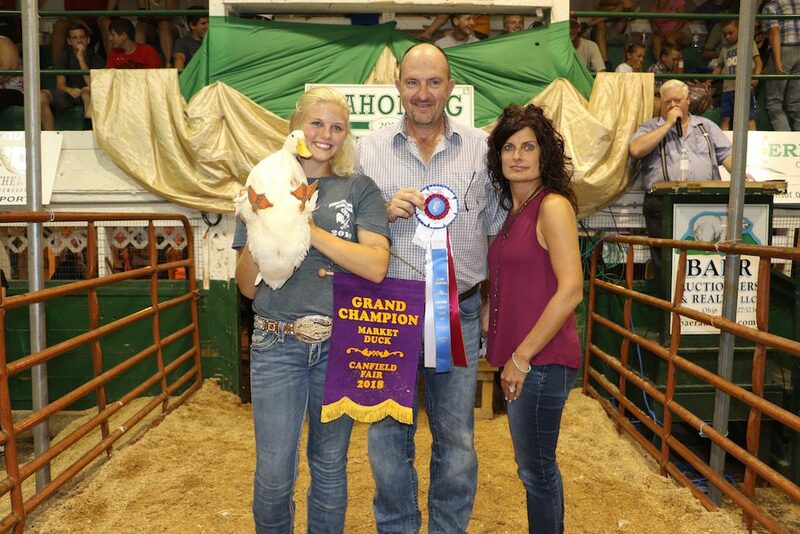 Samantha Campbell’s reserve champion duck sold for $325 to Meagan Van Brocklin. 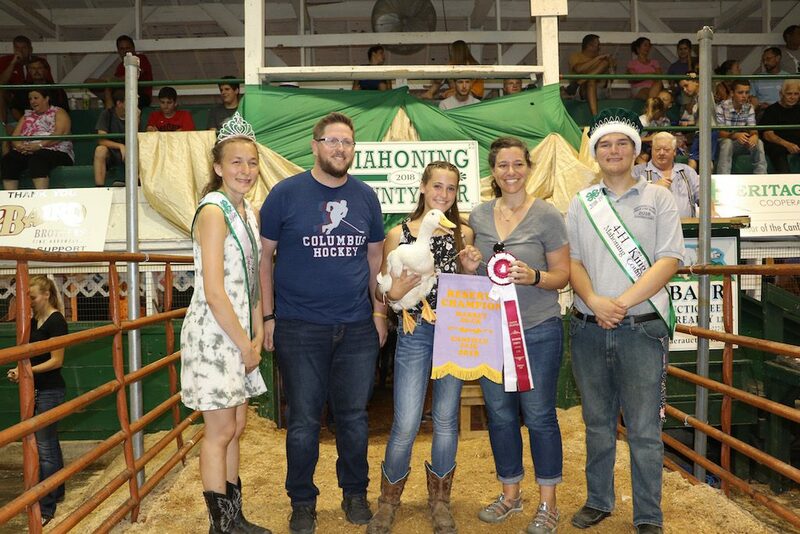 Also pictured is Nick Woods, 4-H King Matthew Fetty and 4H Queen Callie Barwick. 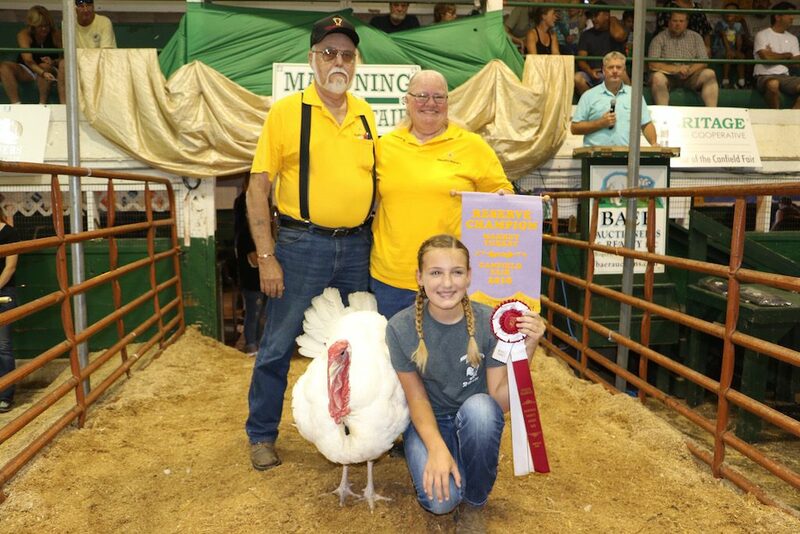 The 34-pound reserve champion turkey, raised by Kendra McCusker, sold for $700 to Zeigler’s Trophies, represented by Terry and Ray Gatrell. 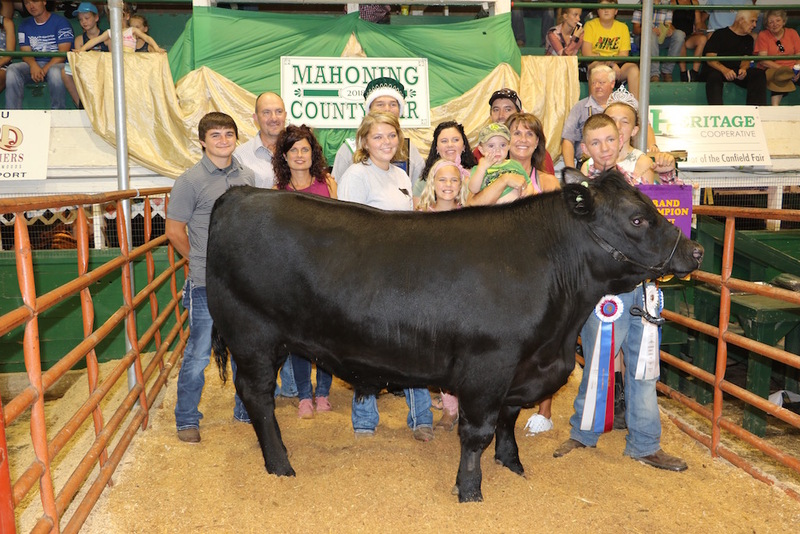 Taylor Whitted’s 479-pound grand champion beef feeder sold for $4 to Sharp Farms, represented by Roger Whitted. Christian Martig’s grand champion cheese basket sold for $2,000 to Dan Kurtz and Nova Vet Service, represented by Todd Plocher. Emmy McCracken sold the reserve champion cheese basket for $1,200 to Ken and Beckie McCracken. 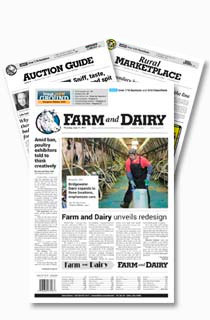 Next articleWould you eat ‘meat’ from a lab?